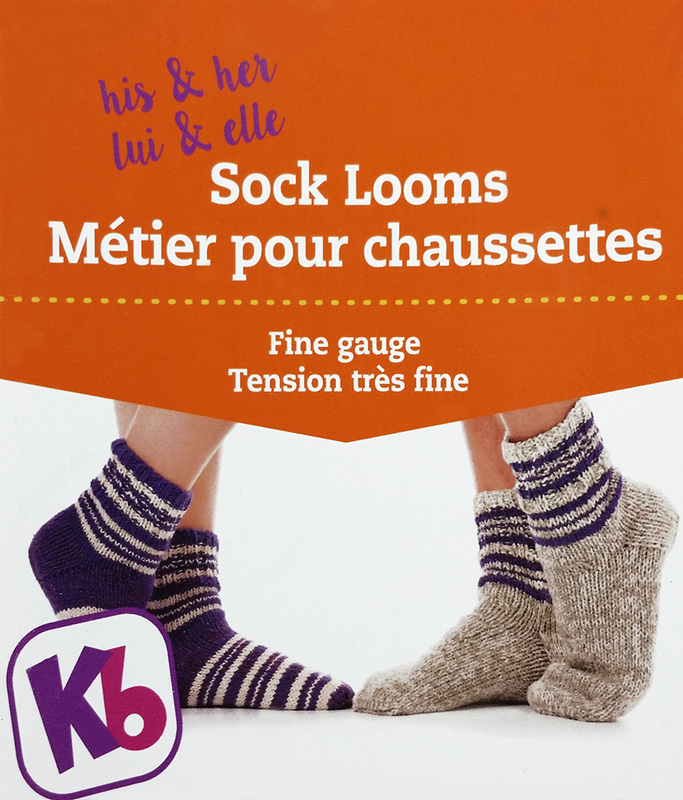 The newest addition to the KB Looms family is the Rotating Double Knit Loom and you can most certainly double knit in the round…the first one on the market with that capability that I am aware of! The other really neat thing about this loom is that it has this attached stand that actually ROTATES as you work! Sweet, right? 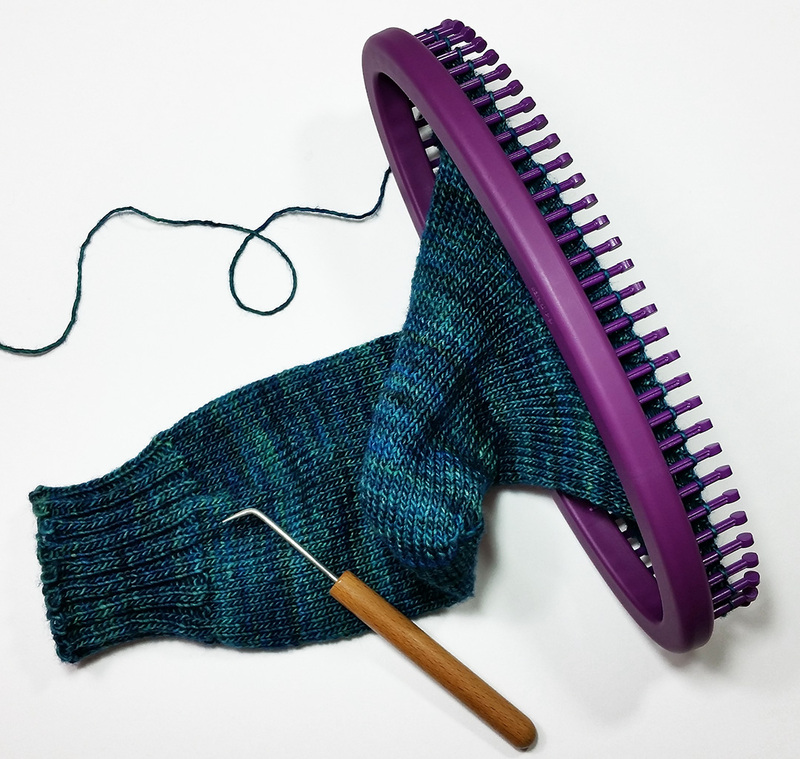 You can also create single knitting while using this rotating base by simply removing the inner loom and the pedestals that hold it and creating whatever you wish on the outer loom only. That is adaptability that is truly intriguing for any loom knitter, for sure! I’m going to let you head on over to the introductory post about this loom for all the knitty gritty details. I had this thought at first, too. 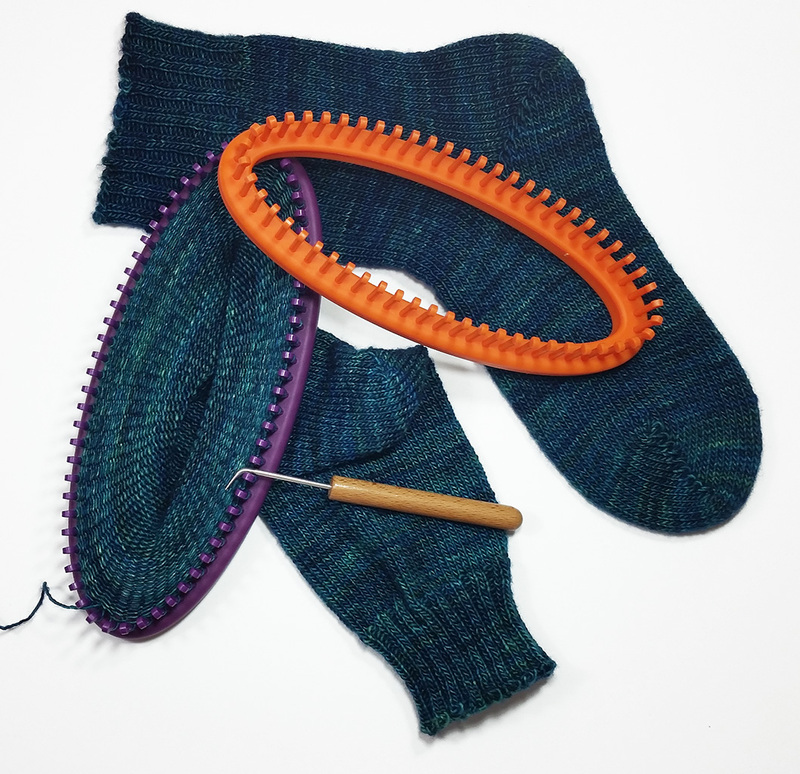 The thing is that when you are creating something in double knit, especially in the round, and you reach the bottom of the framework, you can easily fold the bottom of the work up so that you can continue to knit a long piece. You can even accordion fold or roll it so that more length can be created. The other thing you can do is simply pull the knitting down through one of the openings between the pedestals to make more room. I know that this seems common sense for working a panel of knitting, but it works to a good degree even while working in the round. 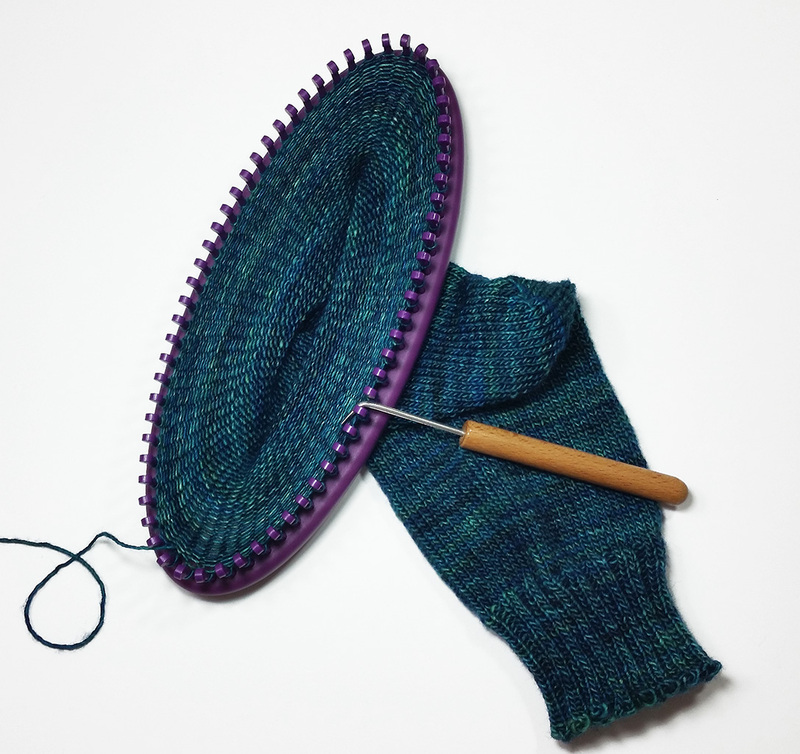 3) The info states: “Knit in the round, or knit flat panels. Use some of the pegs, or all 52 of them, depending on width of knit desired.” Does this include all the pegs on both looms for single knitting? The way this loom works, is that the 2 looms are supported each on their own pedestals. Assemble both looms on their pedestals for use in double knitting up to 52 peg pairs. While working double knit, you can create a panel of 21″ in the round (or as a panel) using all 52 peg pairs. I was using a looser stitch (ribbing) that had a lot of stretch to the stitches so it would easily fit all head sizes (junior-adult) with excellent comfort. When using a tighter double knit stitch (basic stockinette) I found that I knit a panel of 15″ when using all 52 peg pairs. I’m a tighter knitter, so I imagine that other people with a tendency towards a looser tension would achieve a sample a bit larger in width. When single knitting, this loom (the outer one is meant for use in single knitting) is 1/2″ spacing from center of peg to center of peg, so it is comparable to working with the 32 Peg Basic Loom. I worked a sample using U-stitch that came out to be about 10″ using all 52 pegs. which is about 5.5 stitches per inch. Once again, this newest loom from Authentic Knitting Board (see my previous review post here) earns a 5 SHEEP rating from me! 😀 Well done, KB! Stay tuned for a brand new pattern I will be releasing soon using this new loom! It incorporates both single and double knitting to best experience the wonderful features of the Double Knit Loom. I think you’ll like it!